If you’ve had a water meter installed, then you were likely offered aerator fittings for your taps and a mini-hour glass to time your showers. The further addition of a ‘save-a-flush’ pack to your cistern might bolster your arsenal of water-saving devices that knock a few pounds off your bill, but are these efforts enough to avert water shortages predicted for England within the next 25 years? This dire prediction was made by Sir James Bevan, the chief executive of the Environment Agency, who warned that demand from the rising population would outstrip the failing supply resulting from climate change. The public certainly has its part to play, with Bevan noting that public water usage must drop by a third. He added that there should also be a campaign to halve leakage from water utility pipes, a situation that engineers will no doubt be lending their expertise to. But more broadly, how can engineers most effectively help to alleviate looming water shortages? That was the question posed in last week’s poll, and just over a quarter of respondents (27 per cent) thought that industrial consumption of water should be minimised. 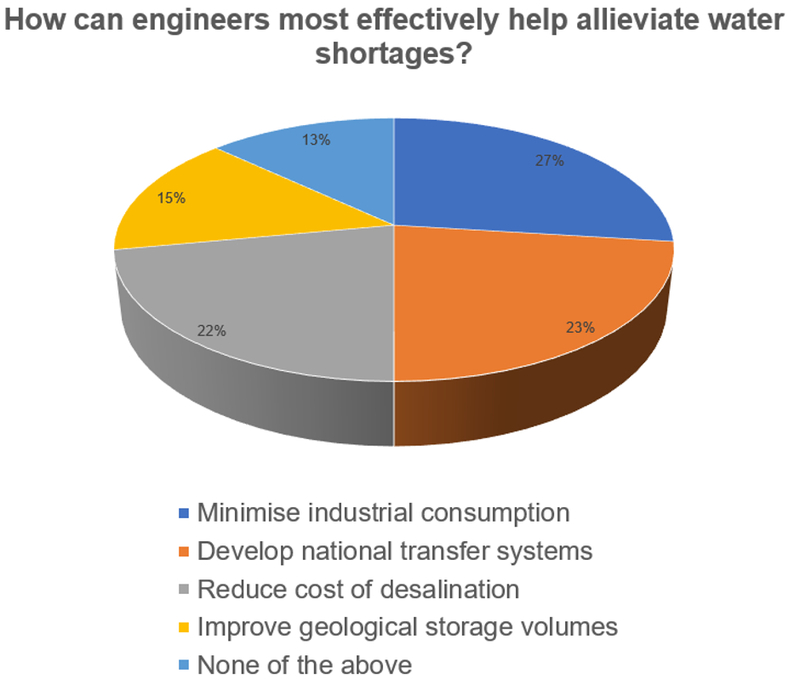 Just under a quarter (23 per cent) agreed that a national water transfer system should be developed, whilst 22 per cent of respondents thought reducing the cost of desalination would work best. The remaining 28 per cent of the vote went to improving volumes of geological storage (15 per cent), and those that couldn’t find a fit (13 per cent) and chose ‘none of the above’. *Implement a national water infrastructure. *Carry out an in-depth analysis of exactly how many people the country can support with the available water supplies and then limit population based on that. *Ban fracking as it uses huge amounts of water and pollutes the water table. *Introduce a tourist water tax. What do you think? The debate continues in Comments below, although we do remind contributors to familiarise themselves with our comment guidelines for readers. Grey water systems for reusing waste water (where feasible) are used in the off-grid/self sufficient communities. Maybe some potential there for domestic and industrial usage. So, just how much water is lost in the pipe lines and why would the target be to halve it not reduce to zero (or at least as close as possible)? How about linking new reservoirs with pumped water for electical storage, two utilities working together a step too far perhaps? The most important thing to do to save water is to stop the leaks, yet this is not an option in the poll. The potential water shortage will be a result of poor planning on water companies (only in it for the profit), a ‘must build more houses’ government with no thought for infrastructure and an increasing population. Sort this out and there maybe no shortages! Demand sided measures should not be neglected with water. A severe shortage could be turned into a surplus if we used water wisely. It can also be the least cost option. environmentally appropriate solution. This tends to be the least cost option, much lower than building new reservoirs, piping water from one region to another, building new treatment plants or building desalination plants. to save 21m2 of water per household each year. a profit from selling less water (& electricity, gas, District heating hot water, etc.) ? Plant more trees on the high moorlands that have been deforested in the last 400 years, to reduce floods and absorb CO2. Build more reservoirs to avoid floods and provide drinking water and provide hydro power (and storage). Link reservoirs’ water to the areas of growth, which should not mean diverting all water to the overheating South East of England. A national distribution system was mooted in the 1970’s but scrapped due to cost. How short sighted – oil, gas, petrol are pipeline shipped over long distances, why not water from the ‘wet’ areas of the country to the ‘dry’. London and the South East will always be short of water due to geography and climate so bring it in from areas that have excess like Lake District and Scotland? The answer is in the question ! And it is the obvious answer to many questions BUT it is by far the most massive ELEPHANT in the room. Stop the population growing – not just in the UK but globally ! Time to cut out this insanity which is medical and drug companies to make money by keeping as many people alive as long as possible ! 3 score years and 10 about the only thing in the Bible I agree with ! I’m not sure how engineers could help with that. Thank goodness someone else see’s the obvious. Maybe engineers should press the subject of population growth upon government; with respect to power consumption and ease the pressure to build on green belt land. More importantly as humans, stop the awful increase in population density which must surely be detrimental to mental health too. It is a far reaching subject for humanity! If it is true that two of the major issues facing the planet are rising sea levels and water shortages, then more efficient desalination should go some way to addressing both. In the 70s, when I was living in the USA, one state (I shall not say which) actually delivered a brick to each house hold: to be placed in the toilet cistern to reduce the flush? water shortages in England… is this a joke? We need a national water policy based on potential demand (including “stress test” allowance for “unprecedented” dry spells), with investment in infrastructure (pipework and new reservoirs) not pretend that we can reduce demand any further. The idea that we should pay water companies profits out of such an essential service is hard to understand. My workshop has an old victorian underground beehive cistern, which is fed from half the roof gutters. The water is used to flush two toilets, wash hands and also to feed a steam cleaner. Being commercial premises I also have a water meter, and it saves a fortune. I never run out of water. this could easily be built into new properties, maybe even a communal one on estates. We do not have a water shortage, we simply do not save enough water, allowing it to pour into rivers and dissapear into the sea. Our local Canal had all its locks restored many years ago, with dire warnings that global warming would mean there was not enough water to use them. It is in a constant state of overflow, with all the lock bypass channels running! Make rain water harvesting systems mandatory in new builds. > Reduce waste through leaks. > Implement a national water infrastructure. > Carry out an in-depth analysis of exactly how many people the country can support with the available water supplies and then limit population based on that. > Ban fracking as it uses huge amounts of water and pollutes the water table. > Introduce a tourist water tax. Again, population limitation is a matter that’s (perhaps thankfully) out of the control of engineers. Your point on fracking is well-made, although it isn’t actually done anywhere in the UK at the moment. They have desalination plants in Cyprus & nobody goes short & it doesn’t cost as much as ours that falls from the sky, funny that! Better washing machines … dishwashers … flushing WC ? Saudi Arabia gets its water from de-sal plants and they never seem to be short of water even in the interior. Population is about half of England (albeit rising faster). Also, how about every building collecting its rainwater and, with a suitable filtration system, this could be re-used for toilet flushes and maybe even drinking water ? Creating a water grid to move water from the regions to the water starved South East will only compound other problems already there, traffic congestion, lack of housing land, overburdened school and hospital infrastructure. The lack of water and all the other problems could be solved easily by redistributing jobs to areas where these problems are not so acute. Quick short remedy , replace all baths in hotels with showers and all new build housing with showers. Send all water company bosses to hot countries to see how they deal with the problem. Build a national water grid. A rain water harvesting system is the best solution for the future, not only on buildings but also on catchments. Engineers can only do so much, I personally believe it’s down to the consumers. Using less and being conscious about where/how we’re using our water. A big one I bet hardly anyone considers is meat production, it’s 600+ gallons of water to produce a single burger. Those interested in population growth should take a look at Gapminder and the wonderful short talks on TED by Hans Rosling. We don’t need a trillion pound national grid for water, just a small pragmatic point to point system where the need is greatest. Pontcysyllte Aqueduct (the tallest aqueduct in the World) in North Wales bridged a missing link in the canal network at the time. It was funded by supplying water from the River Dee to Bristol. I hear there is plenty of water in Lancashire. There are canals to the South, why not use them. Water isn’t like electricity where the supply has to meet the demand instantaneously. There are reservoirs. If Cornwall is short of water in Summer, it only needs a small tube from Axbridge to Cornwall, to gradually migrate water from Lancashire over 12 months, to satisfy the peak demand for two months in Summer (from tourists when the Schools are on holiday). And so, Mr. Graham, who gets to decide which old person to off this week? That is just a nasty comment you made. Old people enrich the culture, not destroy it! Everyone is worthwhile in the eyes of the author of The Bible. How about we worry about supplying and conserving water where it is most needed, and let the Higher Power sort out the other? Another scare story. There seems to be an endless stream of these On what evidence was the pronouncement made that the country will be short of water by 2050? Has it been forensically audited, assumptions tested and any modelling work pored over. ? The trouble with these Armageddon scenarios is that they attract a lot of hype and then vanish. Doing a back check in 2050 might imply a hand from the grave. The leaks in our systems count for countless millions of wasted gallons of water, all treated!! the water board repairers openly admitted they cannot keep up with reported leaks & one on our land was spewing night & day for weeks before they came to sort it out!! I am old enough to recall a comment from a politician of one persuasion that for the other (in Government) supposedly running a country almost completely surrounded by water teeming with fish and built upon coal fields, to create a shortage of both at the same time, required a very rare skill. How long a battle in the Courts does it take to gain permission for a single new reservoir? I believe the last was 8 years. There in a nutshell (whatever that means) is the reason for most of what ails us. Conflict, not outcome! At least some of the comments relate to rainwater harvesting. We have lived entirely from rainwater for over 15 years, all free from the sky, through one of the biggest droughts in Australian history. Yes, you need a big roof, clean gutters and big collection tanks, and the occasional microbial test to check for contamination, but that’s in Australia where it dosen’t rain for many, many months and yet we still have more than enough for 5 showers a day. What’s the problem with the rain in the UK? You can’t drink your rain water? Maybe cleaning up your sky is the answer? Or too many rodents on the roof? One aspect that has not yet been mentioned is direct reuse. This being the treatment and upgrading of wastewater for immediate reuse. It is viable, safe and is being practiced in increasing amounts. One of the most notable examples is Singapore with its NeWater scheme. Orange County in California started this in the 90s for aquifer recharge (indirect reuse). This is less expensive than desalination as the incremental upgrade of the water is lower. The Western Corridor Scheme in Australia used recycled water to feed high usage industrial operations as part of the drought alleviation measures in the 2000’s, the infrastructure costs a substantial amount, but the question is what value does a society place on water security?